Ok so you want to take part in a jewellery class but you are not sure what you would like to make. You don’t even know how to make a ring so how can you design one? And you’re not sure what can be made in the time of the class. Fear not I will help you. 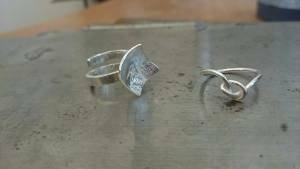 In the 4 hour class you will learn how to saw pierce, form, texture, solder and polish metal and you will go away with your own silver ring. If you are not quite sure what to make I can help you design something. But to save time during the class try looking at the internet for inspiration. Pinterest is a great place to get some ideas. This is a beginners class so don’t choose something that is really complicated and unfortunately stone setting is too advanced at this stage. I will have another class for stone setting in the future. 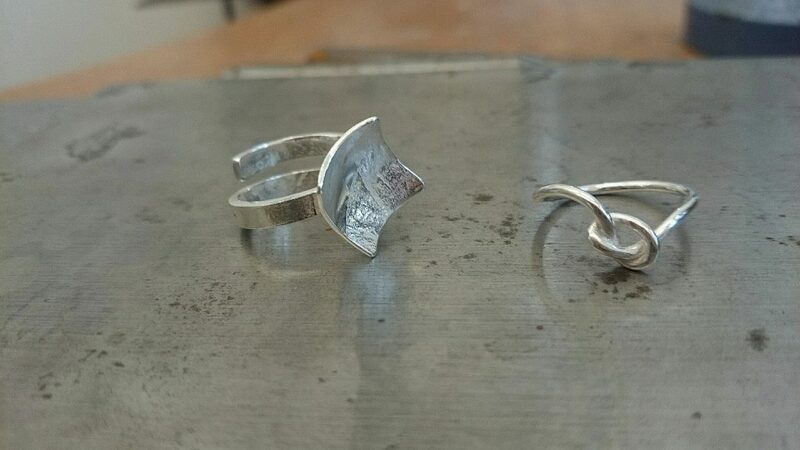 Here’s some examples of rings that some of my students managed to make in the 4 hour class. This will hopefully give you an idea of what is possible to make during the 4 hours. 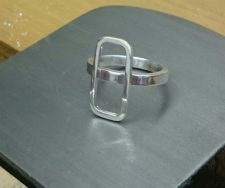 So you can make a textured silver band out of sheet metal like this one above…..
Or if you are feeling adventurous you can saw pierce out shapes or form a shape from wire, then solder it to your ring band. If this has inspired you and you want to book a group ring making class, you can book here. However if you would like to do a one to one class you can book a bespoke class with me here. Or perhaps you are getting married and fancy saving some money and want to have a fun afternoon together with your partner. You can book a make your own wedding ring class here. 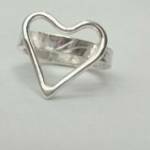 In the wedding ring class you can make each others rings or make your own and they don’t need to be in gold. Want some more inspiration? Here are other examples of the rings that my students made in the group ring making class. As you can see from the images below, everyone makes their own person, unique ring. You don’t go away with the same piece. You will be able to make something to your own individual style that you can treasure forever. Look at these lovely wire shapes. 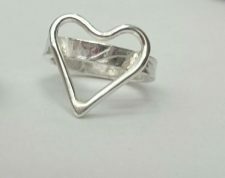 The heart ring was made by a 11 year old girl and her mother. The rectangle ring was made by one of my clients who commissioned me to make a gold pendant and bangle in the same shape. She wanted to make a ring to match the set. Sometimes the design you choose is too time consuming for a 4 hour class like this flower ring below. Both these designs were very fiddily to make. Mostly it’s the simplest looking designs that are the hardest to make. This double wire knot was very difficult to get your head around and this flower design was more time consuming to make. The flower ring took 5hrs and 15 minutes with the help of me saw piercing and cost more on materials. 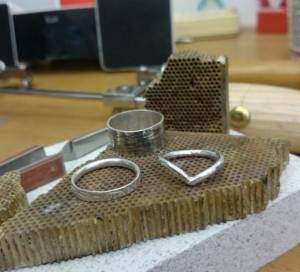 When booking a jewellery class the cost covers 4 hours and silver materials. However if you go over time, I will have to charge a little extra, approximately £20 per hour. And if your design is particularly chunky and requires a lot of silver, or if you make a mistake and need to start again, then you will be charged extra. The cost is dependent on your design and will be paid at the end of the class. Look at what my students have said about the classes. I’ve had great feedback! So what would you like to make? 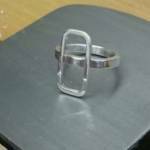 My Group ring making classes are on special offer until 28th January. You can book a class for £70 per person rather than £100. You can book a class here, just select the date you want to book and pay by PayPal or bank transfer.